Roll up, roll up! 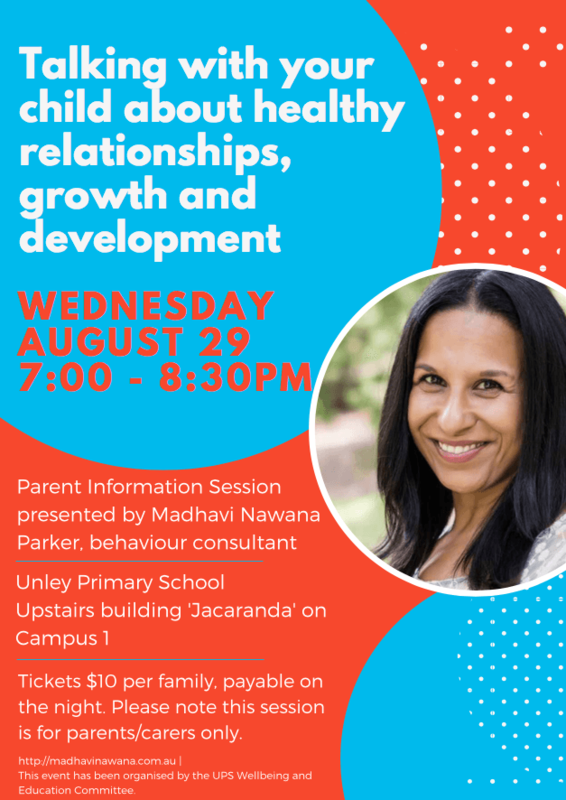 We are thrilled to welcome renowned behaviour consultant (and fellow parent) Madhavi Nawana Parker to UPS to share with us her top tips on how to broach confidently and sensitively the subject of healthy relationships, growth and development with our children. If you have been wondering, at what age do we start talking? what is the right thing to say? or how much is “too much” information for my child?, then this is a session not to be missed. Madhavi will explore these questions and more in her Parent Information Session on Wednesday 29 August, in Week 6 of this term. PLEASE NOTE THAT THIS SESSION IS FOR PARENTS AND CARERS ONLY, NOT FOR STUDENTS. Please add this date to you calendar – we look forward to seeing you there!